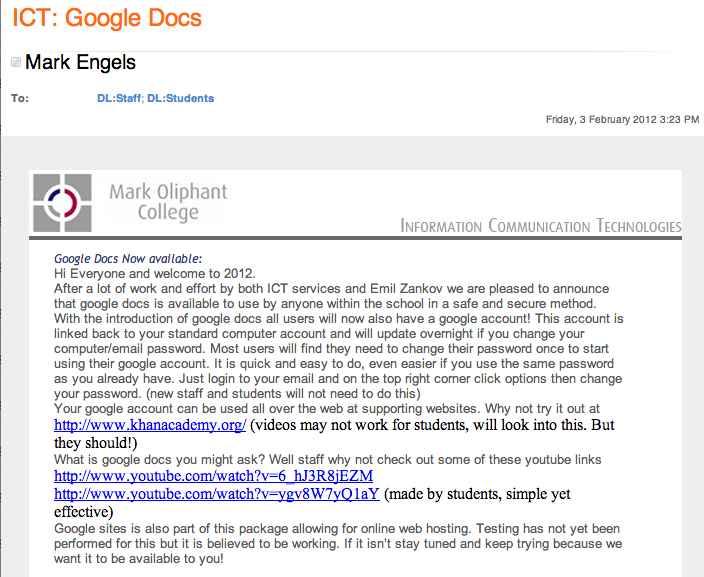 So in keeping with my promise to blog more I present you the journey to Google Apps launching at Mark Oliphant College in 2012. MOC is initiating a 'teacher leader' program this year which looks to give teachers opportunities to run projects/programs so that they can expand their experience in leadership and overall program development. Towards the end of last year it was clear to me that I needed to outline my involvement and engagement on projects I have run. Formalising work achieved is not only beneficial from a reflective sense but importantly gives the 'modern' job application extra support. 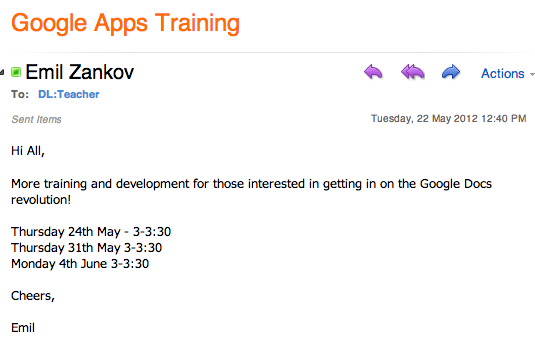 The timeline presented at the end of this blog post is in the form of emails. 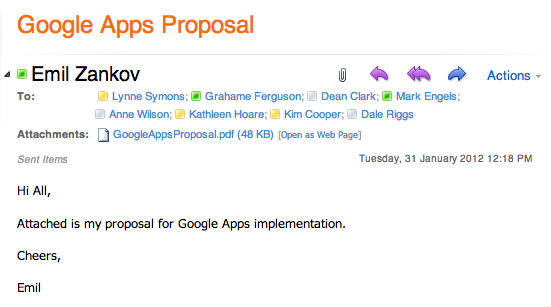 This year I hope to record some reflections from staff actively using Google Apps over the last two years. 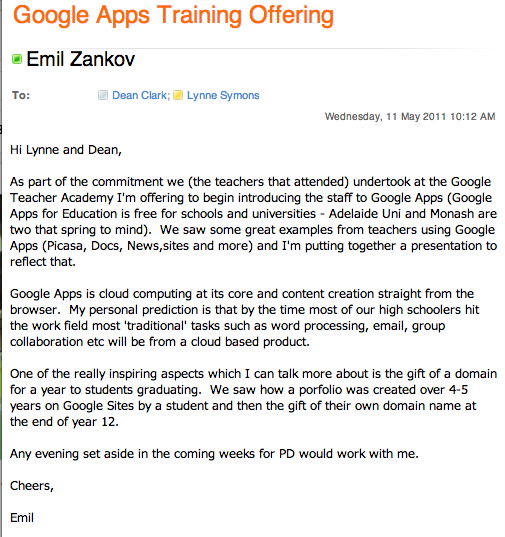 The GCT was a 2 day event at the Google office in Sydney which involved the training of educators from a range of fields. We were introduced to the entire platform of apps and were able to explore how experienced teachers using Google Apps in the class were getting the most out of the products. Significantly this training further cemented my view that Digital Portfolios were vital in the future 'digital backpack' of staff and students. 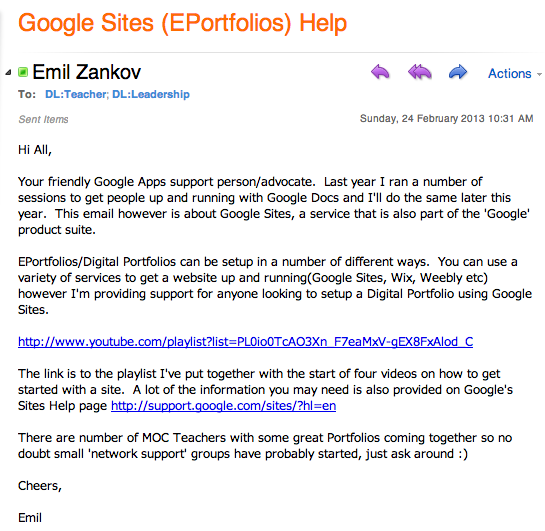 Staff and students at MOC have been creating digital portfolios (some with Google sites others with different products) since and 2014 looks to be a big year in pushing further DP use. Google Sites (the product used by some staff and students) also allowed the development rather easily of the Senior Years Counselling Page. A simple template was shared and edit access given to staff; From there the site grew by individual teachers adding their own pages. As is mentioned in the 'digital portfolio' email below, a really unique 'gift' to graduating students I saw at the GCT was that of buying an individual URL for graduating students. Students who finished High School and had developed their digital portfolio were then given the URL. This is a rather cost effective innovative gift ($10) and something we could look at again in the future as our students develop their DP's. - Google Forms - more student and staff use. The video I recorded quickly and 'dirty (i.e recorded and published in under 5 minutes)' at the end of last year has inspired me to do a ton more this year! Thank you for reading and please post any comments/feedback at the end of the post. Training and support began soon after we went live! ICT were integral to solving all the technical issues!